If you’re looking for a property with sloping beams, ornate cornicing and traditional fireplaces then a modern new-build home is unlikely to be for you. Nevertheless, property developers can no longer be accused of building identical rabbit hutch-style homes, instead taking the time to give each house some personality of its very own. This progression in house-building is undoubtedly part of 8 Provost Black Way’s appeal. Among the clean lines and generous room sizes, the five-bedroom property has plenty of its own quirks and character, proving you needn’t necessarily buy a 100-year-old crumbling cottage to get a home with heart. Located just outside Banchory, the stillness of Provost Black Way is broken only by the gently babbling stream which cuts through the street. To get to the front door of Number 8, visitors must bump down over the property’s very own charming bridge, something which the Johnson family have very much enjoyed over the past eight years. “We bought the property when it was new in 2010,” said Norma, 46. “We’d lived in two new homes before and really liked the easiness of the whole process as well as the ready-to-go nature of a new build. “I’m not much for DIY and neither is my husband particularly,” she laughed. But despite their experience with modern properties, Number 8 was quite a change from where the family had been living. “Previous to here we had actually been living in an old converted church in Strachan,” said Gary, 47. “It was a great property and something totally different. “Unfortunately, it was just the location which wasn’t quite right for us. “We really wanted to be in Banchory as there is so much more to do for families. So when Number 8 came on the market, the Johnson’s jumped at the chance to purchase a brand new home in their ideal location. The property has proven to be the ideal place to raise their two children, Amy, 20, and 17-year-old Kate. “It’s been a great place to raise our family as it’s just a 20-minute walk to the school,” said Norma, who works as a boutique shop assistant. But with their girls now both studying in Aberdeen and craving more independence, Norma and Gary have decided to relocate closer to the city centre. “We are thinking probably somewhere in the west end of the city,” said Gary, who is mechanical engineer. “It might stop me from having to be Dad Cabs so often! “But we are sad to leave this house as we’ve loved it over the years. It is no wonder the Johnsons have stayed put in Number 8 for so long, as the stunning property has everything a growing family could want. 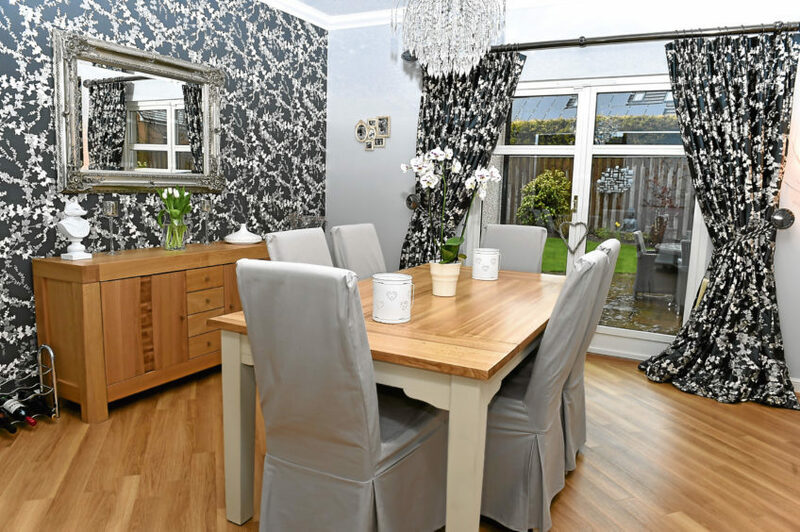 The open-plan kitchen, dining and family room is clearly the heart of the home and is where the Johnsons have found themselves spending the most time. Ideal for entertaining as well as for daily family meals, the space is flooded with natural light from windows on all sides. The modern kitchen area features a stylish island breakfast bar, while double french doors provide access to the west-facing sun terrace, ready for a bit of alfresco dining this summer. 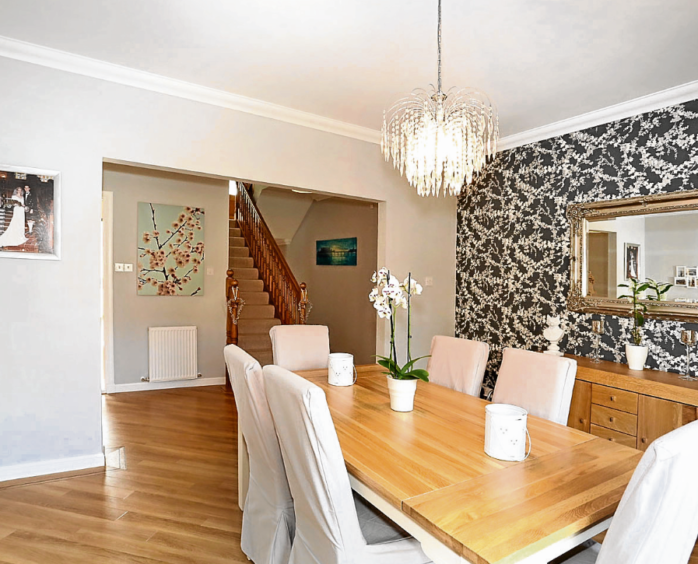 More formal dinners can be held in the separate dining room, which also has french doors ready for guests to spill into the rear garden on sunny evenings. 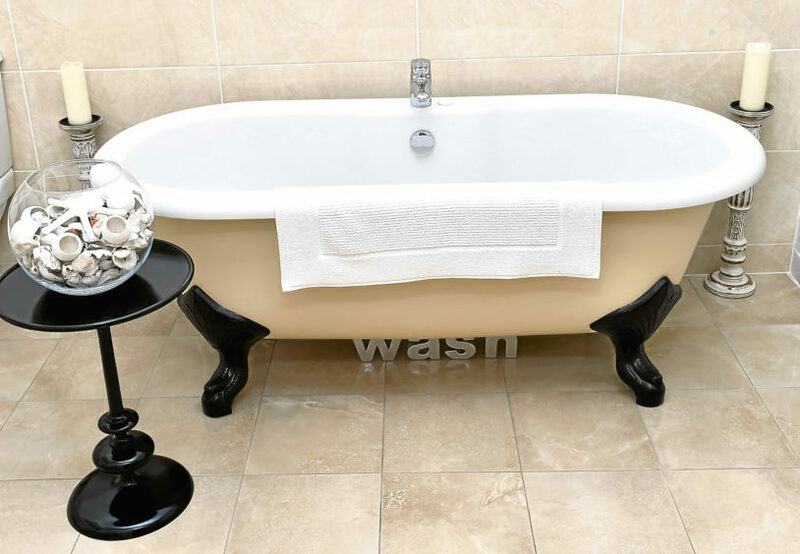 The fabulous ground floor master suite is the perfect spot to relax after a long day, with its very own separate dressing area and en suite complete with a free-standing roll top bath. A cloakroom, utility area and bedroom/study finish this floor. Upstairs there are three further good-sized bedrooms along with the family bathroom. However, the jewel in the crown of Number 8 is the impressive main lounge which can be found on upper mezzanine level. Bright white decor and a wonderful cathedral-style ceiling give this room a stunning modern feel, but the focal point is surely the wonderful gable end balcony. With country views on all sides and ample space for outdoor furniture, you can watch the sun set in style from the comfort of your own fabulous terrace. 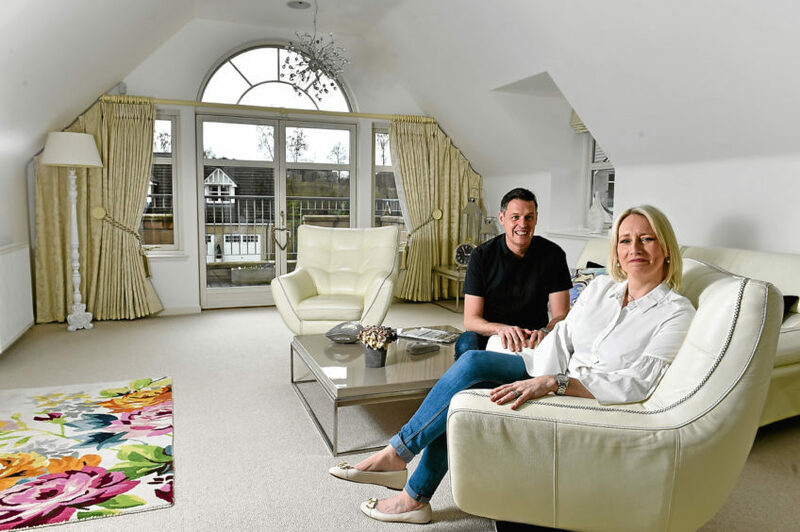 So although buying a new house with plenty of clean lines and open-plan spaces might not be for everyone, the Johnsons can vouch that it certainly has its perks. 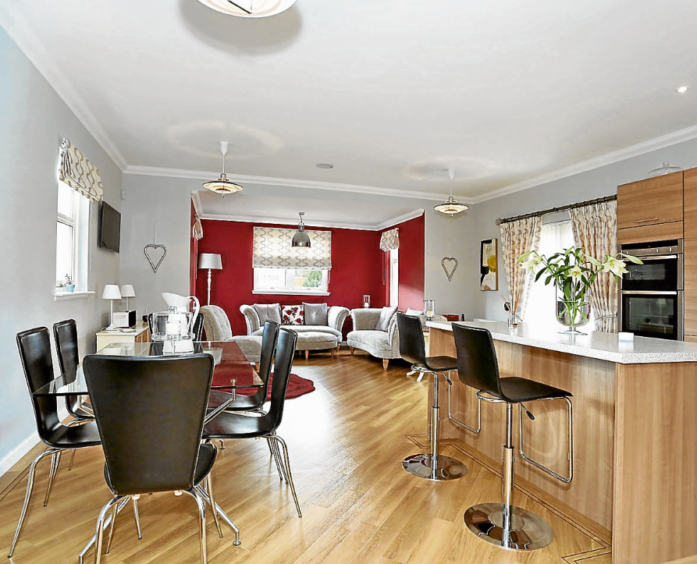 Offers should be made in the region of more than £620,000. 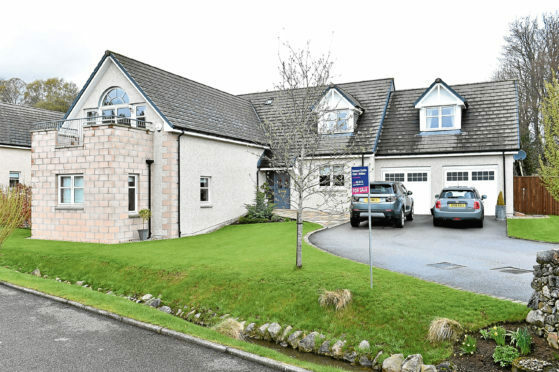 Contact Raeburn Christie Clark and Wallace on 01330 822931 or the owner on 01330 820655.